← What Is Lock Time? 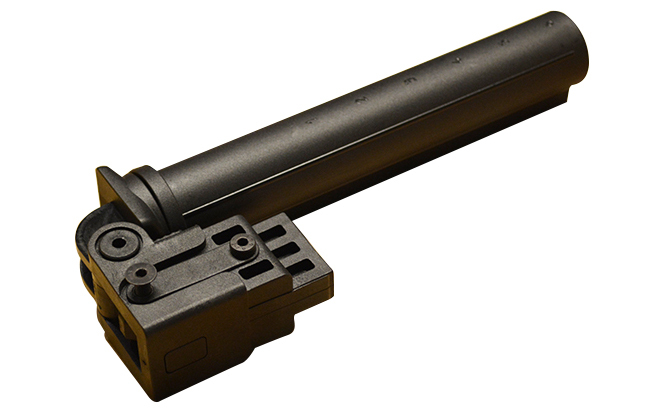 CAA USA announced that CAA ambidextrous, side-folding, 6-position, polymer, collapsible stock tube is now available and shipping to retailers across the country. The CAA side-folding, stock tube (AK47SFSP) allows the installation of M4-style stocks on most AK-style rifles with Saiga stamped receivers. The CAA side-folding stock tube provides rifle enthusiasts and professionals with CQB and covert carry capabilities and easily converts from left-hand to right-hand folding positions. button). The 6-positions allow the user to customize the fit of the stock for a personalized and comfortable fit. The CAA side-folding, 6-position, collapsible tube accepts all commercial AR15/M4 collapsible stocks including CAA’s skeletonized (SKBS) and collapsible (CBS) buttstocks. Available in black only with an Unconditional Lifetime Warranty, the CAA AK47SFSP collapsible tube for AK47’s has an MSRP of $ 114.99. This entry was posted in Accessories and tagged AK47, AK47SFSP, CAA, collapsible, stock. Bookmark the permalink.